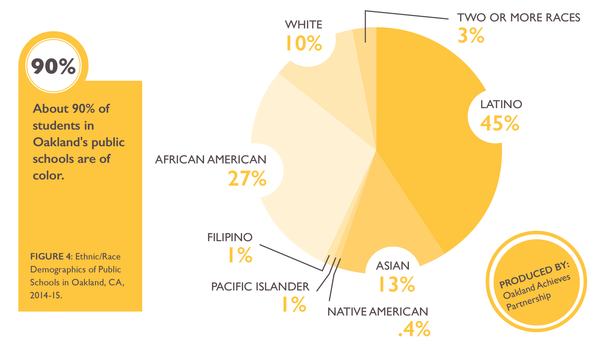 Close to 90 percent of Oakland’s public school population are students of color. According to a new national study, students of color, specifically African American and Latino students, are more likely to attend high-poverty schools where the majority of their classmates qualify as poor or low-income. The Atlantic has reported the findings from The National Equity Atlas with data from the largest 100 cities in the country. The National Equity Atlas analyzed Free and Reduced Lunch data, the findings of which researchers believe are the best predictors of the racial achievement gap. 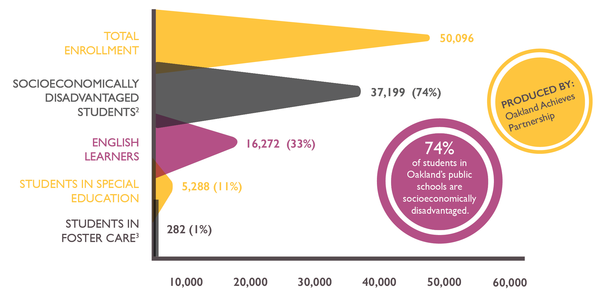 In Oakland, over 37,000 students (or 74 percent of the 50,096 students in OUSD) are classified as socioeconomically disadvantaged, according to data from Oakland Achieves. 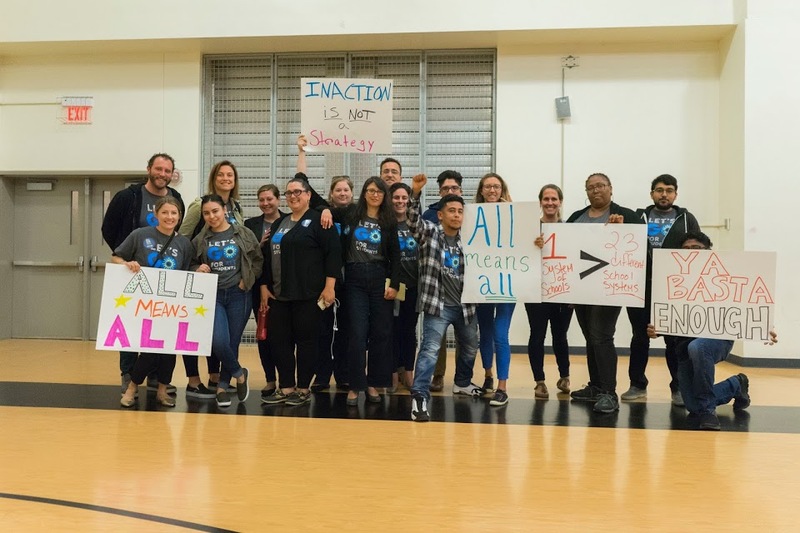 Oakland Achieves did not analyze the proportion of students of color that attend high-poverty schools, however CORE District, a new system that includes 10 California school districts and provides new holistic measurements of school performance by district schools, collects this data. 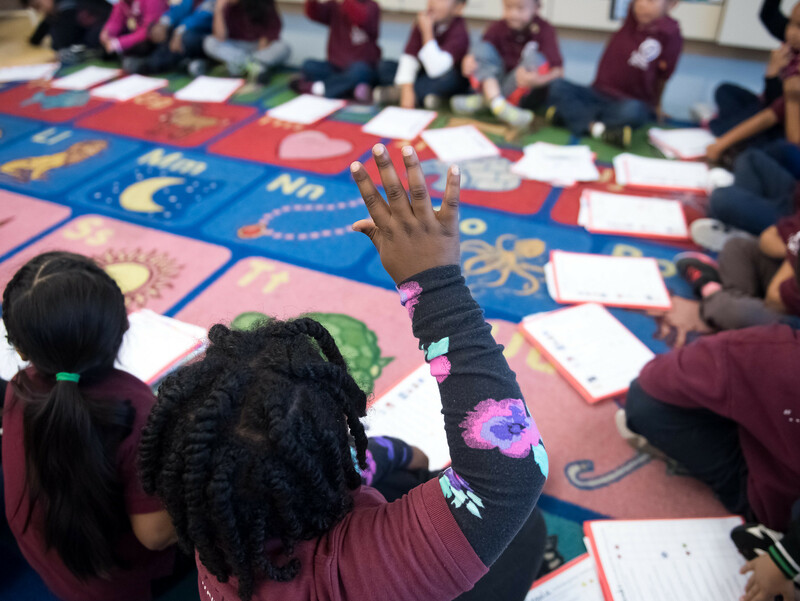 According to GO Public Schools Oakland’s analysis of the CORE data, Oakland’s African-American and Latino student enrollment was consistent with national trends in the National Equity Atlas analysis. *In the CORE data, “socioeconomically disadvantaged” includes students that receive Free and Reduced Lunch data, as well as students whose parents/guardians don’t have a high school diploma.